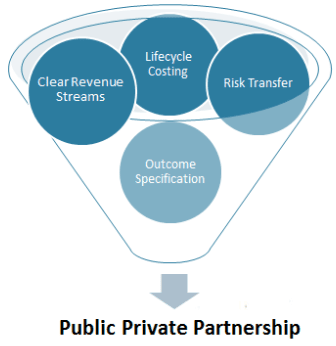 Public Private Partnership (PPPs) are contracts between the public sector and private sector. It requires new investments by the private partner (money, or technology, or expertise/time, or reputation, etc.) which transfers some key risks to the private sector (design/technology, construction/installation, availability, demand, etc.). Payments are made in exchange for performance, for the purpose of delivering a service traditionally provided by the public sector. It involves sharing and transferring of risks and rewards between the public sector and the partners. PPP is about creating, nurturing and sustaining an effective relationship between the Government and the private sector. Such partnerships attempt to utilise multi-sectoral and multi-disciplinary expertise to structure, finance and deliver desired policy outcomes that are of public interest. It aims to leverage private sector expertise and capital to obtain efficiency gains in service delivery and asset creation. Achieving improved value for money by utilising the innovative capabilities and skills to deliver performance improvements and efficiency savings. Public Private Partnership has contract periods of 25 to 30 years or longer. Financing comes partly from the private sector but requires payments from the public sector and/or users over the project’s lifetime. The private partner participates in designing, completing, implementing and funding the project, while the public partner focuses on defining and monitoring compliance with the objectives. Risks are distributed between the public and private partners according to the ability of each to assess, control and cope with them. Public Private Partnership is found in transport infrastructures such as highways, airports, railroads, bridges and tunnels. Municipal and environmental infrastructure includes water and wastewater facilities. Public service accommodations include school buildings, prisons, student dormitories and entertainment or sports facilities. Design-Build (DB): Private-sector partner designs and builds the infrastructure to meet the public-sector partner’s specifications, often for a fixed price. The private-sector partner assumes all risk. Operation & Maintenance Contract (O & M): Private-sector partner, under contract, operates a publicly-owned asset for a specific period of time. The public partner retains ownership of the assets. Design-Build-Finance-Operate (DBFO): The private-sector partner designs, finances and constructs a new infrastructure component and operates/maintains it under a long-term lease. The private-sector partner transfers the infrastructure component to the public-sector partner when the lease is up. Build-Own-Operate (BOO): In this type of model private-sector partner finances, builds, owns and operates the infrastructure component in perpetuity. The public-sector partner’s constraints are stated in the original agreement and through on-going regulatory authority. Build-Own-Operate-Transfer (BOOT): In this private-sector partner is granted authorization to finance, design, build and operate an infrastructure component (and to charge user fees) for a specific period of time, after which ownership is transferred back to the public-sector partner. Buy-Build-Operate (BBO): This publicly-owned asset is legally transferred to a private-sector partner for a designated period of time. Build-lease-operate-transfer (BLOT): The private-sector partner designs, finances and builds a facility on leased public land. The private-sector partner operates the facility for the duration of the land lease. Assets are transferred to the public-sector partner when the lease expires. Finance Only: The private-sector partner, usually a financial services company, funds the infrastructure component and charges the public-sector partner interest for use of the funds. Physical infrastructures such as roads or railways involve construction risks. Private partner typically bears the burden in case of any fault. 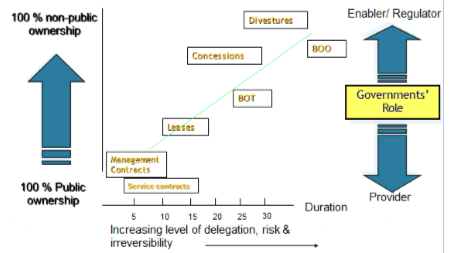 The private partner faces availability risk if it cannot provide the service promised. Demand risk occurs when there are fewer users than expected for the service or infrastructure, such as toll roads, bridges or tunnels. If the public partner agreed to pay a minimum fee no matter the demand, that partner bears the risk. Renegotiation of the assets due to long-term nature of the projects. The success of PPP depends on the degree to which the public and private sector partners align their efforts in achieving these objectives. Also, the organizational cultures in the private and public sector differ widely. This may result in conflicting situations since e-Governance involves substantial process reform needing interaction between the partner company and the government agency or agencies in charge of the ‘domain’. It is necessary to create an appropriate coordination and review mechanism that develops mutual trust and confidence.